The pioneer of automotive snorkels that you will associate with the classics – Fords, Jeeps, and Landrovers – Safari still hold the title of market leader 35 years on. Safari Snorkels are synonymous with quality and durability, and no other brand can boast a 20+ year snorkel service life. What makes Safari Snorkels the best in the industry? With the goal of bringing you the best in 4x4 engine performance and protection, Safari 4x4 Engineering are the brand to watch for recreational and commercial 4x4 products. They stand for innovation, development, and quality, ensuring each product is backed by research and rigorously tested. Safari Snorkels are guaranteed to withstand the unrelenting Australian climate, outperforming competitors. Each Safari product is created with the mantra that ‘product performance must always be reliably achieved’; they deliver on this promise by designing, developing, producing, and distributing their snorkels completely in Australia. A tribute to their success, Safari Snorkel have been named ‘Best Aftermarket Product of the Year’ two times in the 4x4 Australia Magazine. A poor air ram will not separate water from the incoming air stream or provide effective airflow. The air rams you will find on Safari Snorkels are the result of 35 years of field experience, CAD testing, and lab testing. The result? A versatile air ram that has no trouble dealing with torrential rainfall and that can even be loosened and turned rearward for prevent snow or dust from accumulating. Using their own Industrial Spec. UV Stabilised Polyethylene, the snorkels are CAD designed to precisely fit the OEM sheet material of the vehicle. This puts Safari above replica versions of their snorkels, who simply cannot fit the OEM vehicle in the same way or have the same intricate level of manufacturing required to truly withstand a harsh UV environment. The snorkel you choose should be sealed, allowing water protection. Snorkel construction materials should be durable, robust, and boast a smooth interior free from obstructions. Even when powder-coated or plated black for appearance, all Safari snorkel external hardware is stainless steel with a UV-stable polyethylene body. This ensures corrosion-resistant internal and external fittings and fixtures. With custom-designed EPDM moulded rubber connection ducting, the durability is unbeatable – it is even rated to a continual 130°C operating temperature. Your Snorkel mist line up with your bonnet and a-pillar, attaching seamlessly to vehicle. Safari delivers on these fronts, with the vehicle-specific snorkels being intelligently designed for individual vehicle fitment, achieving a flawless connection. Both the V-Spec and ARMAX range of safari snorkels have the performance advantages you’ll want out of a 4x4 snorkel. Safari ensures that you will have clean, dry air is always available, no matter what environment you’re in due to the air-ram rotation feature; they ensure that each model is positively sealed for ultimate engine protection, even across rivers and dusty outback conditions; and they ensure that the least amount of resistance for your engine’s air intake is guaranteed. What suits my vehicle? A Safari V-Spec Snorkel or the premium ARMAX Safari Snorkel? Whether buying for recreation or commercial 4x4 use, it’s important to grasp the differences between the Safari V-Spec and Safari ARMAX 4X4 Snorkels. The Safari V-spec snorkel has all the assets listed above, and suits 4WDs that use petrol or have a smaller diesel engine – given, in each case, that you not plan to add performance upgrades to your vehicle. The Safari ARMAX models, while also boasting the V-Spec features, are performance-orientated 4x4 snorkels with the aim of providing ‘cooler, cleaner air, more air, and more power.’ Safari were inspired to develop the ARMAX range when, during their performance turbocharger and intercooler development, they saw a lack of snorkels that can deliver the quality and quantity of air needed for upgraded 4X4s. 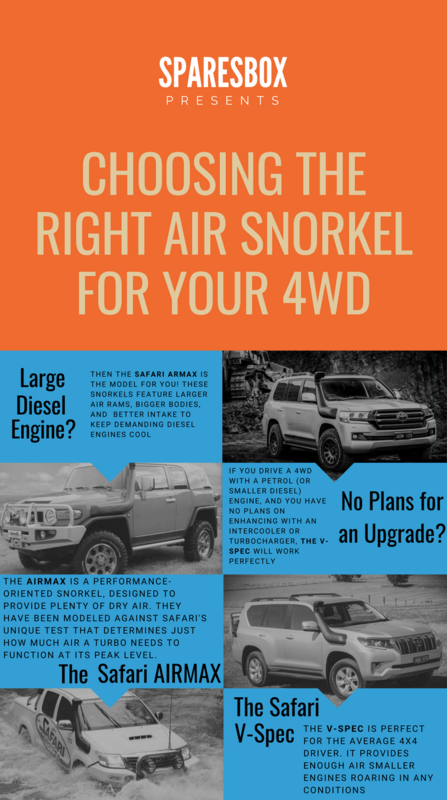 As diesel air must stay cool, without an ARMAX snorkel you risk overheating and breakdown, plus you won’t get the off-road power potential your upgrades allow you! Safari have used the latest technology – often, the first time it has been used for 4x4 snorkel application – to create a snorkel that is synonymous with the current 4x4 marketplace, where performance upgrades are demanding more power from diesel engines than ever before. ARMAX thus boasts bigger air rams, bigger bodies, and better air intake. Safari ARMAX snorkels have been tirelessly developed through new scanning technology (where vehicles can be scanned to allow the best vehicle-specific fitment), 3D printing capabilities (to test prototypes on vehicles), and a new test unique to Safari that indicates how much air turbos need – right up to the 7L mark! To sum it up, if you have a 4x4 with a large diesel engine, or you’re planning to upgrade your intercooler, turbocharger, etc, then the Safari ARMAX is the snorkel for you! For petrol, or smaller diesel engines fitted to a 4WD you don’t plan to enhance, the V-Spec will work perfectly!